In the following post, I describe how to setup a Qlikview Custom Sort Order, which allows you to control the way a field is sorted and displayed. Whether it be in a list box, chart or visual, as a designer you want to make sure the data is presented exactly the way it is intended. You would think that something as basic as sorting a value in a chart would be quite simple. However, this seemingly innocent sort can turn out to be quite painful. If you ever find this task to be difficult, the following steps will solve your problems! Simple enough, right? No, it is quite the opposite and quickly you notice that something is wrong. The values in the Range field are not lining up properly. 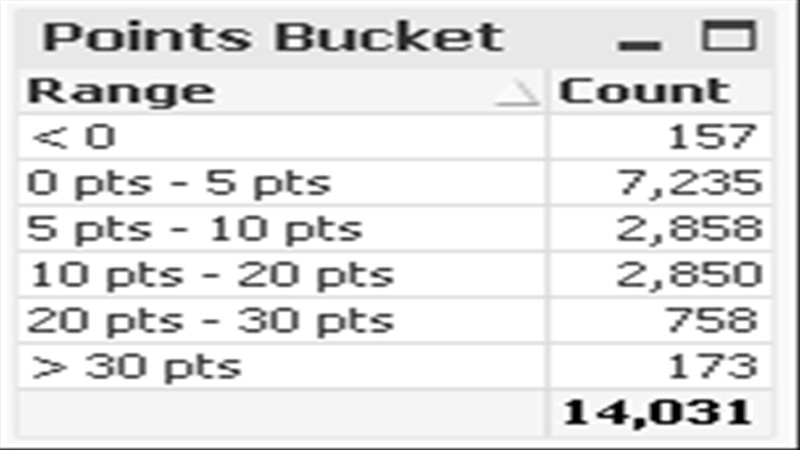 You expect to see the “> 30 pts” bucket at the bottom, but it does not get sorted this way by default. You play around with the sort ordering in the chart properties, but you can’t get it right. I’ve seen examples where designers add an additional column (like an order identifier that is numeric), add it to the chart, then order the chart by is numeric value to get the desired visual. 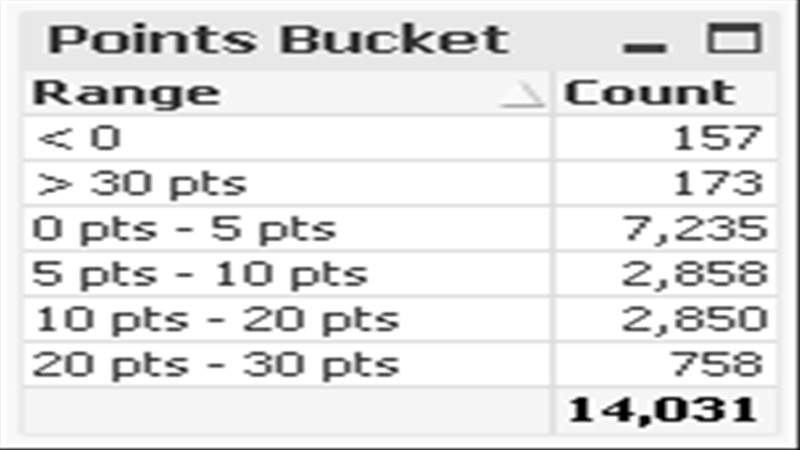 This is not optimal, and it doesn’t solve the problem when you want to display the bucket in a List Box. 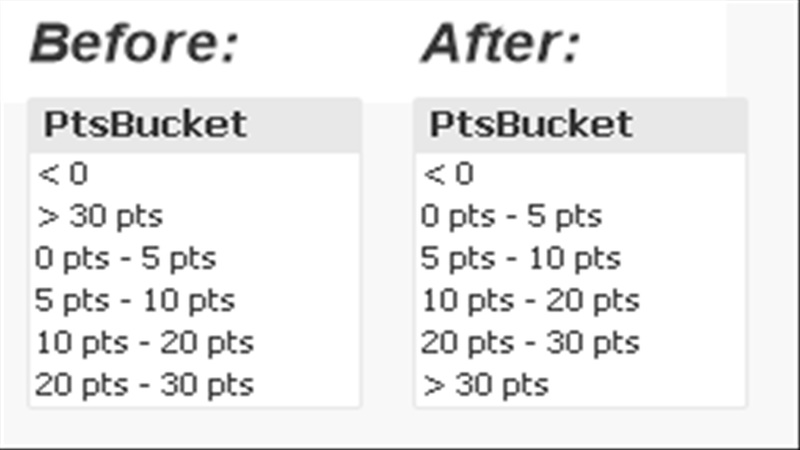 The result of the statement above adds an Inline table called “PtsBucket_SortOrder”. 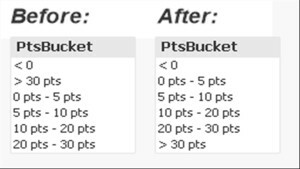 The sole purpose of this Inline table is to establish how the values in field PtsBucket are loaded into your Qlikview application. 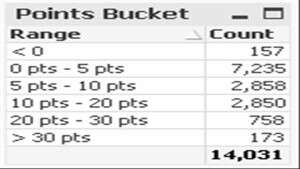 Qlikview stores this as the “Original” Load order for the values in this field, and you can then use this as the primary sort for any object within your application, based on the given field (in my case, PtsBucket). 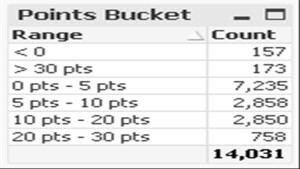 Hence, the chart below now sorts the Range values in the proper way! Finally, make sure you drop the temporary table AFTER you load the data where your field exists. 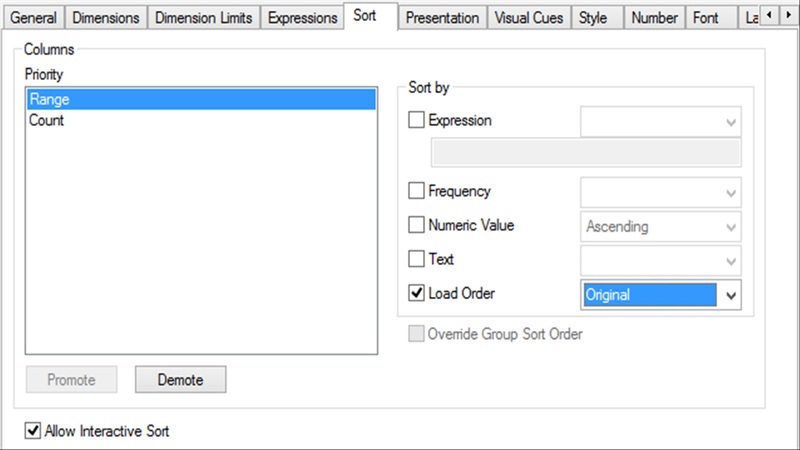 As a result of using the technique illustrated above, you can easily implement a Qlikview Custom Sort Order into your application.